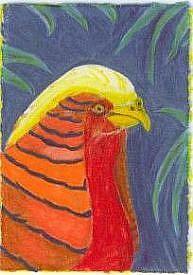 One of two " rips " I have done using Diana Mae Potts series of Golden Pheasant drawings for inspiration. 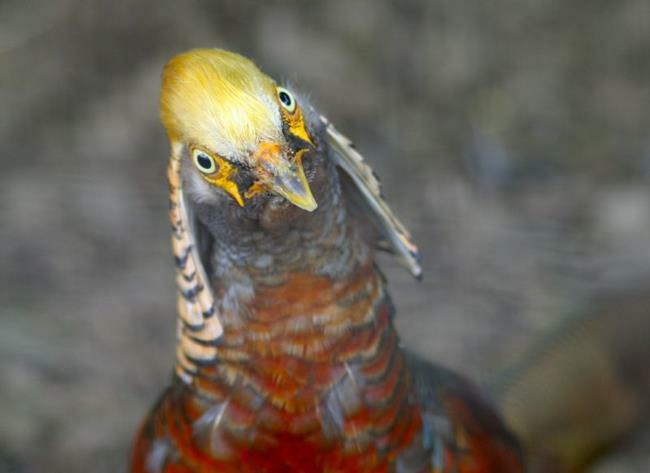 We had planned on " ripping " each other off months ago, but it wasn't until recently that I saw her colorful Golden Pheasant drawings in her portfolio. That is when something clicked. I knew I've seen these birds before, you don't easily forget an animal so colorful. I packed up the camera gear and off to the farms in Lancaster County we went. On one of the farms that we like to frequent because they welcome visitors and sell their produce right on the grounds, I found several Pheasant's that for only a handful of corn were willing to pose for the camera. This image was captured using a Canon 10D fitted with a Canon 70-200mm F4 lens. Then printed on Epson Premium Luster paper.